I'm so excited I could SPEW!! I bought an Excalibur Food Dehydrator today!! I've been hmmmmming and haaawing for a few weeks now, not sure if I'd use it enough to make it worth spending the money. I mean, I'm pretty new to this level of raw foods (aka more than just salad and carrot sticks), so did I really know if it was for me? But then I realized that the amount of time and effort I've put into trying to use my super-old not very good dehydrator, and how enthusiastic I am about incorporating more raw foods into my diet after this month is done, and how many GREAT recipes are out there for raw dishes you wouldn't even think of... And I decided to do it. There are so many things which aren't really great for us, or in fact may even be bad, that can be made raw and so much more healthily. For instance, crackers, pies, cakes, cookies, pizza, tortillas... It's kind of crazy actually! I also realized today that my making my own raw almond milk, instead of buying it, is actually SAVING ME MONEY! The price for one tetra pack, just short of a litre, is now $3.29. Plus the waste of the tetra pack itself. The price of about a cup of almonds? About $2. Enough said! I can't wait for my Excalibur to get here! It's going to be a really long however many days it takes to get here!! 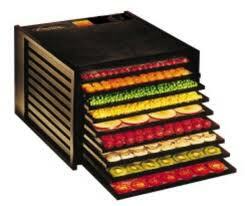 hey im looking to buy a food dehydrator myself, how do you like this one? can you use it to make crackers and such? Hi JJ--I love my dehydrator! It's more expensive, but well worth it, because of the versatility. I can make raw crackers, raw breads, raw veggie burgers, raw cookies, raw cakes... I can set the temperature (cheaper ones are just hot and hot! ), and I can lower it enough to even dry out fresh herbs.